TESTIMONIALS - WHAT CLIENTS SAY. I had begun to stoop and no amount of "stand up straight" changed my posture. I could find no one who made any sense concerning this problem. (And there were plenty of nonsensical theories which I immediately discarded.) I had heard about the benefits of Feldenkrais and found that Jane Ella was a practitioner in Greenville. Her attitude and calm assurance made me want to try her system. With just one session I could tell the difference and I am now very proud of my stance! I am always amazed and thankful for Jane Ella's intuitive sessions. I am usually a bundle of nerves, but she can detangle all of that and send me home with a lesson about how I can move more freely. To me, this is lasting health care. Jane Ella's talent goes far beyond the technical prowess of her work. She has a gift for bringing peace and silence to a space and then helps her clients connect with these qualities within themselves. Jane Ella has been instrumental in bringing hope to our family. 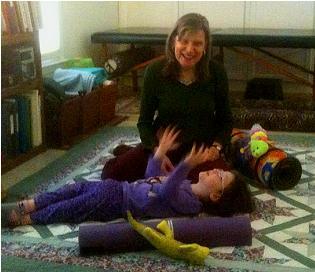 She has helped both myself and my 4-year-old special needs daughter by helping us establish healthier and more natural patterns of movement. She has repeatedly alleviated my aches and pains from running, and from carrying my toddler. For my daughter, she has taught her different ways of interacting with her world and being in her body, when other modalities ceased to promote change.